*Note: all photos are from the website linked in the description. 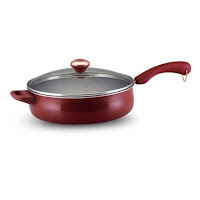 Paula Deen Signature Porcelain Nonstick 5-Quart Covered Deep Saute Pan (Lara)--With higher sides than the average skillet, this is perfect for anyone who's cooking for a crowd. The pan is large enough that you can saute your veggies on the non-stick surface and add the rest of the ingredients without transferring everything to another pot. We've made many a pot of soup in this pan, as well as pasta dishes. 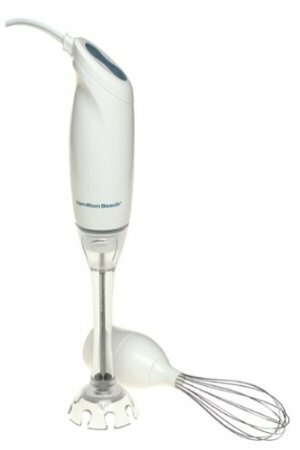 Immersion Blender (Jen). Works great with soups, sauces, or blending things in the pan or crockpot. 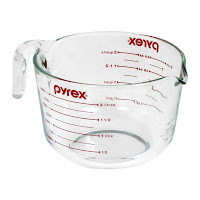 This way you don't have to transfer things from pan to blender and back to pan. 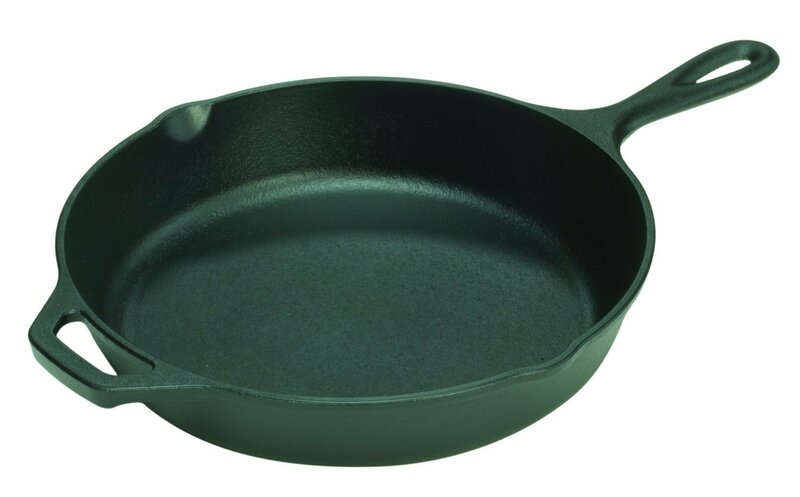 Lodge 12-Inch Pre-Seasoned Cast Iron Skillet (Lara)--While I still love my non-stick pans for some things , I'm a recent convert to cast iron and am quickly growing very fond of them especially for searing meats. They take more upkeep than most pans, but they can withstand high heat (on the stove or in the oven) and they will last forever if you take care of them properly. 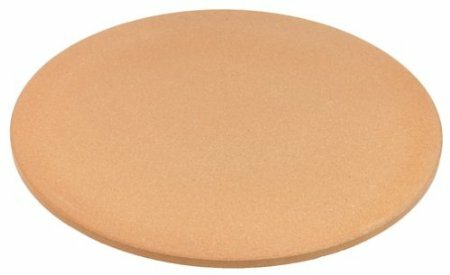 Stoneware Pizza Stone (Lara)--I've had my pizza stone for almost a decade now and just realizing what a real treasure it is. We've always baked cookies and rolls on it and love that the bottoms don't get overdone while waiting for the top to brown. But recently I've learned the secret to perfect pizza crust that is making me a zealous fan! I heat the stoneware at 450-degrees before placing the pizza crust and other toppings on it, then bake at the same temperature. My kids (even my teenagers) have started telling me how much they prefer our homemade pizza over delivery and I blame it all on the stoneware cooked crust! Digital probe thermometer (Jen) I use this timer probably every day. I have had it for years and have only had to change the battery a couple times. The alarm is nice and loud, so you can hear it if you're in the other room. 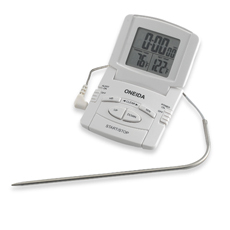 it has a separate timer for when your meat is up to the correct temperature. It is absolutely necessary for the holidays with turkey, ham, cookies, and naughty children in time out! Apple And Potato Peeler Corer (Lara)--I feel like this handy little tool shaves off considerable prep time whenever I'm making anything with apples. 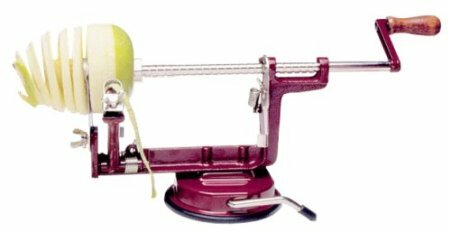 It peels and cuts everything perfectly evenly (or you can change it to not peel if you prefer) within about 30 seconds and the uniform thickness of each slice makes the apples cook evenly in whatever apple dish you're making. Additionally it's great for slicing up apples to give to the kids. 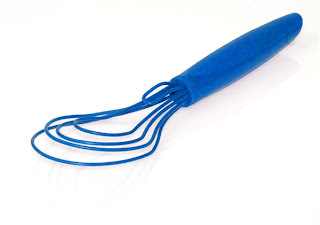 Nylon Flat Whisk (Jen). I can honestly say that when we go on vacation to hotels that have a kitchenette included, I always pack this along in my suitcase. I love it because it doesn't scratch any surface, and it is flat enough to get into those creases at the bottom of the pan when you're whisking sauces, or even melted chocolate! Come to think of it, I should ask Santa for another one because I'm always irritated when it is dirty in the dishwasher and I need to use it. 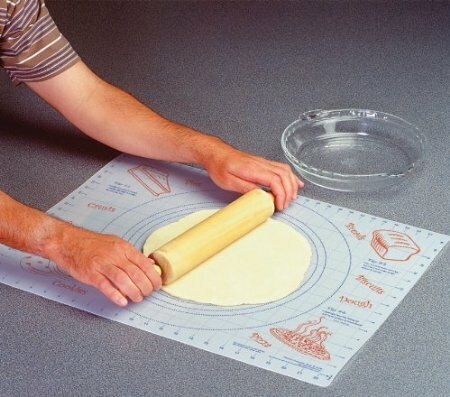 Non-Slip Pastry Mat (Lara)--I absolutely love this mat and use for rolling out pizza crusts, crescent rolls, and pie crusts. It's one of the best loved tools in my entire kitchen and I highly recommend it for anyone who makes pies or pizzas on a regular basis! Microplane Zester/Grater . (Jen and Lara) I love this for zesting the skin of citrus products, but also for hard cheeses like Parmesan. It also works when you want to add that special touch to desserts by grating chocolate on top. Cutco Basting Spoon --This spoon came free with a Cutco order I placed one time and I originally laughed that anyone would pay so much money for a spoon from a company that specializes in knives, but I am now its biggest fan. 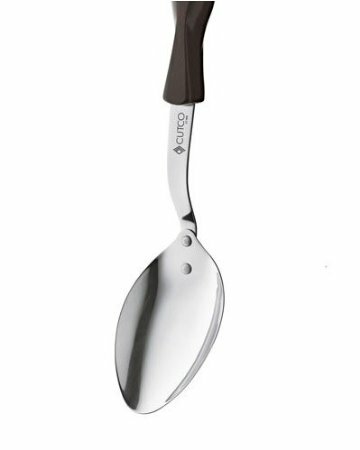 This is a heavy duty spoon that will stir up the thickest mixtures without any give and the shape of the handle somehow makes it less tiring to stir with than other spoons. And as with all Cutco products, it's guaranteed for life, which makes it a good kitchen purchase in my book. Better Homes and Gardens red and white checkered cookbook (Jen). 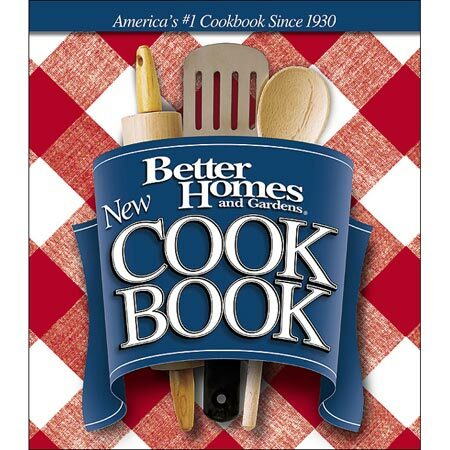 This is always my "go-to" cookbook when I am looking for a for no fail recipe. It has never steered me wrong. My favorite chocolate chip cookie recipe is from here and the crepe recipe is the one I've been using for over 10 years. 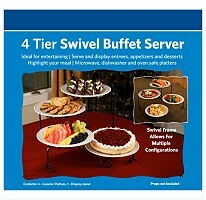 Four tiered swivel buffet server (Jen). I got this at Costco years ago and it is not only beautiful, but super useful if you like to entertain alot. I've used it for dessert platters, veggie platters, hors d'oeuvres platters, when there's just not enough room on the table for all the food, and I will soon be using it for a tiered wedding cake for a friend of mine. I think I only paid $20 for it and I don't even know if you can find this exact one anymore. (the link is to a similar one at Sam's club). But even if you can have any kind of tiered serving platter, even a swiveled one, than it is so worth it. it may be a pain to store somewhere, but if you have to space to keep it safely stored away for a special day, I highly recommend it.